© Williamson et al. ; Licensee Bentham Open. E-Learning methods such as webcasting are being used increasingly in healthcare education, including that of nurses and midwives. Webcasting means live synchronous broadcasting over the internet, where students participate simultaneously in text ‘chat room’ interactive discussions when logged on to a webpage where they can see and hear a presentation such as a PowerPoint lecture, a list of other participants, and access ‘chat rooms’. This paper reports student participation and satisfaction with the use of webcasting in a third year undergraduate nursing and midwifery research methods module in one higher education institution faculty of health and social work in the southwest of England, with students from distributed geographical locations. Students chose either webcasts or face-to-face lectures. Following each of the four webcasts, a web-based evaluation questionnaire was administered in a cross-sectional survey design. Two thirds of students took part in webcasts and found them to be an acceptable teaching and learning strategy. Travel and cost savings were noted through not travelling to the main university campus, and these were statistically significantly correlated with students’ perception of gaining from the module and their overall satisfaction with webcasting. Across the four webcasts 5446 purposeful messages were posted indicating engagement with the material under study. Webcasting is an effective teaching and learning strategy which is popular with students, allows remote access to teaching and learning, and offers time and cost savings to students. Further research is required to investigate the educational potential of this new technology. Keywords: Webcasting, e-learning, nursing, midwifery, nurse education, midwifery education. E-learning for nursing and midwifery students has tended to be asynchronous through internet access to websites and other interactive materials, which are used by students in their own time. With the development of new technologies however, there is potential for the development of interactive, participatory, synchronous methods of e-learning . Webcasting is one such method that also offers students the ability to participate in real-time discussions with each other and with the presenting lecturer (Fig. 1), from any internet connected computer that plays sound. As will be seen from the papers discussed below, the terminology is still relatively new and therefore not all authors use it the same way, with the potential for confusion. The differences in terminology are made clear after the importance of webcasting is outlined. How the webcast appears to the participant. DiMaria-Ghalili and Ostrow were among the first to use web casting routinely in nursing education. They had previously used interactive TV but changed to webcasting in the spring of 2003 to deliver distance learning for graduate nurses in rural West Virginia (USA) [2, 3]. At that time some of their students were still using dial-up connections to the Internet. Nevertheless, the method was acceptable and thought to be more interactive than interactive TV. For example, one student said ’I thought the Webcast was good. I think people are more interactive because they do not have to be on screen. Also, it seems to provide much more of an opportunity for questions and feedback than the [interactive television]. Being at home is an obvious advantage. If technological difficulties are minimal, I think this is going to be great.’ . An experimental study with 79 Malaysian bioscience students  investigated the relationship between test scores and four methods of delivery of six hours of teaching split into three two-hourly sessions: live streaming (n = 17), pre-recording for transmission at a specified time (n = 21) but with no synchronous interactivity, ‘video-on-demand’ when students chose when to view a podcast (n = 20) and a face-to-face lecture group which served as the control group (n = 21). Those taking lectures by ‘video-on-demand’ (podcasts) gained most in test results. The University of Wisconsin-Madison E-business Institute published an online report  of their survey with a sample of more than 27,000 students. They discussed their findings in relation to filmed lectures (they used the term webcasting) indicating that 82% of their respondents expressed a preference for courses that captured lectures and allowed them to be streamed and recorded. This paper  is useful as it indicates that students were comfortable with the concept of lectures other than by face-to-face means. Perceived additional benefits included making up for a missed class; watching lectures on demand for convenience; improved retention of class materials; improved test scores, and allowing material to be reviewed before class. However, the study had low response rates of only 25%. One study  at McMaster University, Canada, sought the views of post-qualifying doctors, nurses, faculty staff and administrators who had been exposed to webconferencing. It is not clear from the paper if this was used with larger classes or just small groups but the technology appears similar to our webcasting, although it may have included (as the term implies) video connection with all participants. They concluded that three viewpoints were in evidence amongst their participants, these being ‘pragmatists’, ‘positive communicators’, and ‘shy enthusiasts’. All were broadly in favour of webconferencing, although pragmatists were more cautious, believing that the technology was an enabler, particularly when face-to-face meetings were not possible. The authors concluded that further uses should be explored in healthcare education. Yagi et al. used webcasting in a large geographically dispersed Pathology Department, and concluded that successful webcasting depends on the creation of a faculty steering committee to control resources and manage growth, the availability of support for technical staff, and embedding the service as part of the core departmental information technology infrastructure. Disadvantages of webcasting noted in the literature are mainly related to technical issues such as the need for students and staff to understand and receive training in how the technology works [6, 8], problems with connection speed, bandwidth and server access [8, 9], and in some cases lack of interpersonal interaction . Others have noted that technical success is not always followed by organisational adoption of the technology . Webcasting to mean live synchronous broadcasting over the internet, where online students only can participate simultaneously in audio or text ‘chat room’ interactive discussions. 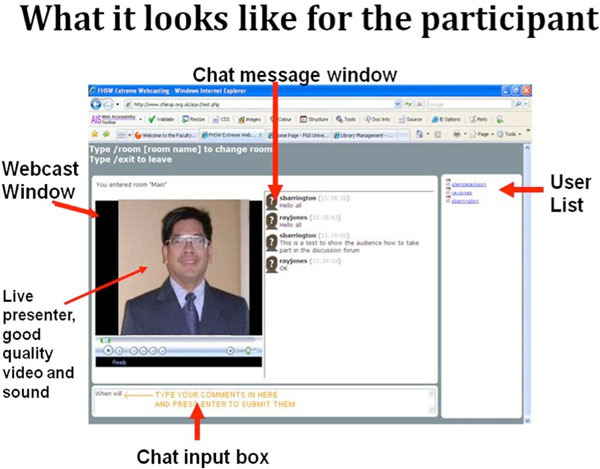 Students log on to a webpage, can see and hear the presenter and a presentation such as a PowerPoint lecture, a list of other participants, and the current ‘chat’ (Fig. 1). Video linked lectures to mean real time events that are face-to-face lectures, which are also broadcast to other sites. The audience at the other site interacts by a videoconference link. Podcast to mean a recording, either audio (sound file) or video (video clip), that can be viewed or downloaded to view or listen to on demand. Some people differentiate between audio (podcast) and video (vodcast) but we use podcast to mean either. Some people use webcast to simply mean a podcast. We do not use the term in that way. Live streaming to mean a live synchronous broadcast over the internet but with no simultaneous interaction by viewers. Live streamed lectures to mean a face-to-face lecture that is filmed and broadcast simultaneously over the internet but either with no interaction from the online audience or at best intermittent attention to the online audience. Recorded webcasts to mean a recording of a live webcast, archived for viewing later without the interactivity. In essence, this is a podcast but we differentiate the term to show its source. Some lecturers now record their face-face lecture as audio to make available as podcasts and some podcasts are professionally recorded. Filmed lectures to mean face-to-face lectures that are filmed and subsequently made available as podcasts. Again these could be called podcasts, but calling them filmed lectures helps identify the source. Webconferencing to mean online interaction where all participants can be seen and heard via a video link (webcam) and perhaps can also interact via a shared document or white board. Webpages to mean static pages of ‘information’; quizzes, animations produced for asynchronous use by students, not related to a lecturer-student event (i.e. traditional e-learning). Even with the above attempt to clarify the terminology we realise that it is evolving rapidly, and different papers use the terminology in different ways and include different combinations of features. However, synthesis of the literature arguably indicates that webcasting offers the potential to improve significantly the teaching and learning experience for students by providing: more flexible and effective learning environments; the opportunity for collaboration between institutions and therefore a more efficient delivery of healthcare education; and re-usable learning objects (modules, podules, teaching and learning resources). In relation to undergraduate healthcare education, curricula delivered by e-learning with local face-to-face tutorials could have substantial benefits to students and staff by reducing their travel time, and by reducing costs to students who would no longer need to travel to lectures . The setting for this study was a university faculty of health and social work which provides pre- and post-registration professional education to non-medical healthcare professionals. This faculty had been experimenting first with interactive television and then various forms of webcasting for 6 years . This paper reports the experience of students in a ‘research methods’ module shared between four nursing and midwifery degree programmes. Historically, classes were provided at four centres distributed across the South West of England with students coming from a catchment area of approximately 200 miles from ‘end to end’. The immediate impetus for moving some classes to webcasting in September 2008 was the closureof one of the faculty sites. The closure resulted in significant numbers of students facing journeys of two hours or more each way to attend the main site for classes, with the concomitant costs and disruptions to family life accruing from early starts and late evenings. A cross sectional survey design was employed to evaluate students’ experience of teaching and learning by webcast. A questionnaire developed specially for the purpose was used to collect data. This paper reports on student participation and satisfaction with the use of webcasting in a third year undergraduate nursing and midwifery research methods module. The focus of this module was to develop a research proposal. The module had previously been delivered by a combination of six two hour lectures and small group tutorials. In the 2008 academic year, four lectures were available either as live webcasts or, at the same time, as face-to-face lectures at the University’s central site with different members of staff. All 129 third year nursing and midwifery undergraduate students enrolled on the module were invited to attend either a webcast or a face-to-face lecture. In May 2008 an email was sent to students (then in their second year), asking them for their views concerning changing the method of delivery of four of the lectures. Seventy (54%) responded of whom 60 (86% or 47% of the total) indicated that they would be interested in webcasting. Students did not have to commit to either choice but the webcasts were to be run at the same time as face-to-face lectures so that students could not attend both (but they could ‘switch’ between the two methods). Three ‘test’ webcasts open to all students were delivered (two in June and one in September 2008) to familiarise students with the method before the module started. Table 1 shows features that may affect the success of webcasting, noting those used in this application. Fig. (1) shows how it appeared to the participant. Why it is Worth Noting? Webcast is ‘add-on’ to live audience No If the webcast is a ‘streamed lecture’ we believe that the online audience will feel excluded. Furthermore, the presenter is unlikely to be able to interact fully with the online as well as the face-face audience. Webcast audience is online only Yes See above. Live quality video ‘talking head’ of presenter Yes Many people are familiar with ‘jerky’ poor quality video from webcams. By using a video server and good quality cameras we achieve high quality video picture and sound. This is an important part of the delivery but has a ‘trade-off’ with being required to deliver from a ‘mini-studio’. Live PowerPoint or presentation display Yes Essential. List of people participating can be seen by presenter and participants Yes Some webcast systems do not show those logged in. It is important for presenter and participants to know who else is ‘there’. Photo of participants can be seen by other participants Possible Our system facilitates this and we upload photos of participants for other modules but did not do so for this module. Participants can comment in real time by audio link, broadcast as part of webcast (audio chat) No Participation was by typing only. We believe this allows interaction by more participants in large classes. Audio chat requires that participants queue to wait for each to speak. Audio may be essential in some circumstances (e.g. language teaching). Participants can comment in real time by video link, broadcast as part of webcast (video chat) No See above. Others  suggest that it may inhibit interaction. Participants can be divided into break out rooms for discussion Yes Participants can create a chat room ‘on the fly’ simply by ‘changing rooms’. If a new room name is typed the system creates that room. There is no practical limit on the number of rooms, It is the responsibility of the presenter to use ‘break out rooms’ at appropriate times. Recording of participant discussion made available on web for viewing 24/7 Possible Chat room discussion is automatically recorded and we have used it in this paper to analyse types of interaction. Chat could be posted for participants but we did not do so on this occasion. The four webcasts were developed specifically for each two hour session and delivered by two experienced members of the teaching team, and had similar learning objectives as the face-to-face lectures. Three of the webcasts presented material reviewing subjects that students had studied in their second year (qualitative research, quantitative research and critical research methods), and one focused on new material (systematic reviews and meta analysis, and appraisal of clinical guidelines). The lecturers (GRW and JM) were advised by RJ and IM on colour and font size best suited for webcasts and how to encourage student interaction in the webcasts. Each two hour webcast contained opportunities for group discussion and interaction between students in ‘breakout chat rooms’ (Table 2). In addition to the webcast, small, local, face-to-face tutorials were also offered to support students. 2 Systematic reviews & meta analysis; appraisal of clinical guidelines One activity in the middle of the session. No materials needed in advance. Students who were going to access the webcasts were encouraged to get together in small groups (e.g. at friends’ houses) to enhance the learning experience. The sessions were accessible anywhere with a reasonably fast internet-connection on a computer that played sound. No special software was required for students’ computers to access the webcasts. Each session was recorded and made available to view again within a week via the faculty intranet. As use for routine undergraduate teaching was a new development within the faculty a decision was made to have an experienced health informatics academic (IM) present (online) during the webcast to support students who were having technical difficulties and also to facilitate use of the chat rooms. After each of the four webcast sessions the students were sent an email with a web link asking them to complete a web-based questionnaire (available from the authors on request). Each student received a web link containing a unique token, which expired when the student completed the questionnaire. This ensured that the student answered the questionnaire only once. The questionnaire contained 12 questions concerning students’ experience of the webcasts. The first question asked if students were able to view the webcast; nine questions concerned the content of, and students’ satisfaction with, webcasting as a delivery method; and one question asked about time and costs saved as a result of viewing webcasts as opposed to travelling to the university. A final open-ended question asked for any other comments. Our webcasting system can record the text comments made by participants. These were reviewed to classify the type of comments and proportion of students engaging with the session. The questionnaire contained a statement guaranteeing students’ confidentiality and anonymity but, because it was an audit of module delivery and therefore a legitimate part of the faculty’s existing quality assurance mechanisms rather than research, formal ethical approval was not required. In order to shield students from any suggestion of harm, responses were returned electronically not to the module and webcast lead (GRW) but to a separate database. This process was overseen by the faculty’s e-learning facilitator (IM) and only then were the anonymised data sent to the module lead for further analysis. Data were analysed in SPSS version 16 using simple descriptive statistics. In addition, using Spearman’s rho (ρ) to test correlations between variables, we explored whether students’ overall satisfaction with webcasting was influenced by time and cost savings for students by not travelling to the university, by existing knowledge of the subject matter, and by their perception of personal gains accruing from the webcasts. This was done using the results from the first questionnaire responses only, to avoid counting the responses from the same students more than once. The free-text content of the questionnaire responses was also scrutinized using content analysis and broad themes constructed from the brief responses received. Content analysis was inductive, meaning that a model was constructed to describe conceptual data from our students’ responses. There are no formal ‘rules’ for data analysis in content analysis, and judgement was used to classify text into much smaller content categories using coding, categorisation and abstraction, based on repeated reading and understanding of the apparent meaning . Participation and questionnaire response rates are difficult to establish for this study because although students were logged in to the system and these log-in names were visible, one log-in might include four or five students in a small group. Questionnaire response rates are reported in Table 3. Not all students responded to the questionnaires. Also reported in Table 3 are the numbers of times the sessions were viewed again. Approximately 40 students attended the first lecture and 30 subsequently. Questionnaire response rates are calculated based on the numbers of students who could have attended the webcasts and were therefore eligible to complete the survey, not based on the whole cohort as, although all students could have attended by webcast, not all did so. Table 3 indicates that questionnaire response rates were 60% for the first session, 41% for the second, 27% and 19% respectively for the last two webcasts. There were few differences in student ratings between sessions so in most cases only results for the first session are presented. The majority (88%: 95% CI 79-97%) were satisfied or very satisfied with their experience of attending the session by webcast and three quarters (77%: 95% CI 65-89%) would prefer future sessions by webcast rather than face-to-face. On average students saved approximately one and a quarter hours’ travelling time and £10.89 on travel costs. Most (85%:95% CI: 76-94%) agreed that ‘The participant materials (PowerPoint slideshows, reading materials, examples and activities) enhanced my knowledge’ and 83% that ‘The webcast will help me apply the information in my assignment’. Nearly all (97%) thought ‘The presenter(s) were well prepared’ and the majority (82%) that ‘The presenter(s) conveyed the information clearly’. There were slight differences between sessions on agreement that ‘The webcast was the appropriate length’ (78%, 81% 89% and 94% for sessions 1-4 respectively). The more money students saved, the more likely they were to be satisfied with the overall experience of webcasting (Spearman’s ρ = 0.442, p = 0.02). Also, the more students perceived they gained from the webcast the more satisfied they were with the experience overall (ρ = 0.592, p < 0.001) and this was associated with cost and time savings made, as statistically significant correlations were found between ‘I gained a great deal from this webcast’ and time savings (ρ = 0.302, p = 0.039) and cost savings (ρ = 0.329 p = 0.024), indicating that the greater cost and time savings students made by attending by webcast rather than at the university campus, the greater was their perception of gaining from this method of delivery. There were no statistically significant correlations between the variables concerning existing knowledge of the subject matter, their overall rating of the experience of attending the module by webcast and the statement ‘I gained a great deal from the webcast’. Thirty individuals provided comments (Table 4) from the first session on quantitative methods, 29 on the second session on systematic reviews and guidelines, 14 on the third session on qualitative methods, and four on the fourth session on critical research (a total of 77 replies in the free text elements). Students talked about the benefits of webcasts and a preference for the method, highlighting their belief that webcasting was a positive educational experience, offering them something different from traditional lectures, particularly that it improved their ability to interact with the lecturer and the material compared to large group teaching methods. Students also mentioned the cost and time savings made through not travelling to university. Some technical difficulties were experienced by students, although our technical expert (IM) was on hand to deal with these. Being distracted by irrelevant chat in the chat room was an important issue, which included others’ chat and technical queries. Being able to view the recorded webcasts again was also important and they were made available again through the university’s managed learning environment information technology platform. Suggestions on how to improve the presentation and content were also made. I enjoy face to face lectures. However the webcast was very useful for me and I found I was able to concentrate more than I sometimes can in lectures. I have ADD [attention deficit disorder?] which makes concentration etc extremely difficult. This is a major problem in lectures due to the noise in the room, therefore webcast is FANTASTIC! I was more able to ask a question as I get very embarrassed in a lecture hall. I found the webcast very informative and would be happy to use it for other lectures. I prefer webcasting because I struggle with research and don’t feel intimidated asking a question, as no one can see you, or you’re not fighting to be the next person to ask a question, and all the questions were answered timely [sic]. Webcasting is useful and effective for those who travel and allow for group work effectively. Very well executed, four of us watched together which was useful as we could discuss exercises together and gain a better understanding from each other; I would not have liked to have watched it alone. I thought the webcast went very well. People were able to discuss issues well. It is a good medium to deliver lectures. I think it’s so clever and can save individuals so much time and money. It’s very good. I may not live as far away as some students [but I’m] on a student’s budget [and] it helped save a small amount of money on one day, and combined with the rest of the webcast lectures I will save approximately £30+ this week alone. If I need further advice then I’m quite able to email the lecturer or tutor for my group. The webcasting session was extremely useful and convenient. As I did not have to drive for 2 hours I felt more alert and was able to concentrate better on the information being conveyed. Although I can hide this by viewing it on full screen, the words are quite blurry and difficult to read. Also would be a good idea if people went to the 'help room' for any technical difficulties. The webcast wasn’t as successful for me as yesterday. I was able to view yesterday’s with no problem, but kept on being cut off today, even after refreshing the screen on numerous occasions. People chatting in general when lecturer is speaking is very distracting. I will be listening again just because of the sheer volume of information given, to make sure I have not missed anything. Thanks. It helps that you are able to consolidate learning by extra material, thought content was informative, but another listen will consolidate content materials provided. It is so useful having them recorded as I am quite slow at picking things up and so the bits I missed I am able to go back and listen to them again! I have a specified learning difficulty and this type of learning is brilliant for me, especially as I can review the webcast again. FANTASTIC! As this was revision I found webcasting perfect - if I’d have driven to [university site] I would have been gutted! Lecturer really clear and presentations good - enhanced my knowledge whilst recapping on the basics - thanks! Exercises were good- made you think and kept you interested, added variety. I found the group work hard to do online rather than face to face. PowerPoint slides were not very easy to read. Just one thing... maybe the screen could be bigger so the PowerPoints can be read more easily? It is clunky. The PowerPoint slides have poor definition, so it is not that much better than radio. You are brilliant engaging in the flesh, a bit wooden as ‘talking head’. The webcast was good on a new topic, however sometimes the pace was a little fast as it was a new topic. Also I had forgotten some questions when I had a chance to ask them. There was a lot of information in a very short space of time! The transcripts of the four webcast sessions were studied to identify the character of the messages. Over the four webcasts students typed approximately 28,624 words, of which there were approximately 8129 messages (including those between students and between students and lecturers). These were grouped into three types to indicate the character of the interactions which took place; these being ‘purposeful’ (text that concerned the research methods under discussion or a task set by the lecturers), ‘technical’ (concerning some aspect of getting the best out of the webcast technology), and ‘extraneous’ (or ‘chatty chat’, concerning personal topics). In total there was approximately 67% purposeful text, 12% technical and 21% extraneous material. Thus approximately 19,178 words were written by students’ solely in engagement with the material under study and there were approximately 5446 purposeful messages, 975 technical messages and 1707 extraneous messages. Arguably, nursing and midwifery students are not noted for their adoption of technological innovation, but even so a two-thirds majority chose webcasting; with the majority of those these finding it a satisfactory and interactive experience. Our findings illustrate that whilst there were some technical issues; webcasting in this module was acceptable and popular, well supported by students and effective in facilitating discussion, participation and interaction in small groups, within the larger group of participants, and with the material. Some students thought it was more interactive than traditional lectures. In addition, there were considerable benefits to students including reduced cost and travel times and the ability to watch the webcasts again because they were recorded. We found mean savings of £10.89 and an hour and a quarter travel time through webcasting lectures and it is likely that other Higher Education Institutions (HEIs) would find similar savings on offer to its students; greater cost and time savings would obviously be accrued in more geographically dispersed locations. We have not calculated reductions in ‘carbon footprint’ but with a large proportion of 129 students travelling considerable distances, there is a major saving. As many nursing and midwifery students undertake clinical placements at some distance to their university base, webcasting to their clinical placements may be useful and offer opportunities for further savings. It was not surprising that those who saved the most financially were the most satisfied with the overall experience of webcasting, and that those who saved the most time and money believed that they gained the most from the webcast. Our experience supports the benefits identified by others [9, 11] for post-qualifying nurse education. Webcasting may also make nursing more accessible to those with family commitments. In our university many students taking nursing and midwifery programmes are mature women who have needs over-and-above that of traditional undergraduate students. The recent expansion of higher education for UK healthcare practitioners has seen a major targeting of mature women with little evaluation of the impact that attending university has on them . Kevern and Webb  outline their difficulties, saying that ‘greedy institutions’ (the family and higher education institutions) create conflicts for mature women that are difficult to reconcile; these conflicts are made all the more difficult when a necessary part of the overall experience of attending university is travelling to and from a distant site. E-learning makes it easier for mature women (and men) to resolve these conflicts and reconcile some of the competing demands on their time from family and other commitments. In analysing the text for students’ participation the first session contained the most extraneous chat, and as a result the lecturer made a request for this to be stopped in future. Students remarked upon being distracted and annoyed by extraneous chat, which totalled approximately 20% of the total wordage. Lecturers and students need to become accustomed to using these technologies and it is likely that with more practice and guidance from lecturers, students will develop appropriate ‘netiquette’. This concentration on the content, and the sheer volume of purposeful words (approximately 19,000), when coupled with over 5400 purposeful interactions, shows a degree of participation and interaction with the material that is considerably higher than is likely to be in evidence during a straightforward lecture session to a large group of students, and indicates potentially a greater connection with the material and greater participation by them. These conclusions are supported by the content analysis of the free text comments from the questionnaire, where students said that they were able to concentrate more, engage more with the material, and hear better in the webcasts as compared to large group lectures. Although it is not possible in this study to know exactly what interaction took place at home between the small groups of students viewing the webcasts together, it is likely that two levels of interaction happened, within the ‘home’ groups and between those groups and others logged in to the webcast. This is supported by the students’ free text comments, where the interaction with others in small groups was noted as a positive benefit of webcasting, with webcasting discussed as making it easier to contribute by reducing the embarrassment of speaking out in a large group. Thus in our study, we created a more flexible and effective learning environment for students which included the opportunity for greater collaboration between students and therefore, it would appear, a greater and more effective engagement with the material compared to traditional larger groups lectures, confirming these benefits postulated in the literature [1, 6, 8]. Furthermore, posting the recordings on the student intranet allowed students to view the sessions again, and six weeks after initial delivery the sessions had been accessed a total of 220 times. The first two sessions were accessed the most (87 and 102 times in the three months to December 2008) and this may represent a ‘novelty’ factor for students or that these two sessions were available within 24 hours, whilst the last two took a week to make available. Unfortunately we cannot say whether the recordings were accessed by those who attended the webcasts or lecturers, or by students singly or on many multiples of occasions. As the module assignment hand in date is eight months from the delivery of the sessions, it is possible that more students will access them again when considering their assignment preparation. Lectures are widely used throughout UK HEI settings. It would appear that this is as much through tradition and convenience as due to systematic analysis of their educational benefits . Lectures can be motivating and inspiring when students understand their relevance  but some argue  that lectures provide only didactic ‘information-giving’ and are ineffective in offering opportunities for active learning, participation and real engagement with the material under study . Cook et al. undertook a meta-analysis  of 201 studies that showed that internet-based learning had large positive effects but outcomes similar to those found using traditional methods. However the studies included in this systematic review did not report cost or time savings. The high satisfaction ratings with all aspects of the webcasting delivery in this study indicate that webcasting is acceptable and popular and this is consistent with the literature indicating that students were amenable to delivery methods other than face-to-face lectures [4, 5, 9, 16]. Our correlations testing concerning students’ self-reported existing knowledge of the subject matter, their overall rating of the experience of attending the module by webcast and the statement ‘I gained a great deal from the webcast’ indicated that there was no correlation between the variables, and thus for our students this technology was suitable regardless of their how much they believed they knew about the sessions’ content prior to attendance by webcast. Thus we tentatively suggest that webcasting might be an effective means of securing students’ participation and engagement with taught material, and that it is of benefit in making ‘research methods’ teaching and learning interesting, which can otherwise be problematic , and that for our students, their pre-existing knowledge was not a factor in its success. This study is limited by reporting only the views of those who took part in the webcast and by being from one university setting in the South West of England. Our response rates for questionnaire replies from webcast attendees require comment: although 60% responded to the first questionnaire, this decreased to 41%, 27% and 19% for subsequent sessions. This is likely to be due to ‘questionnaire fatigue’ amongst students, who became bored with, or blasé about, their completion. As our quantitative findings were based on analysis of the first questionnaire only, whilst disappointed with the low subsequent response rates, we are reasonably pleased with an initial response rate of 60%. Even so, we must acknowledge that our 40% non-response reduces the effective sample size and may therefore have introduced an element of bias  in that students with either very favourable or very unfavourable views on webcasting might have been motivated to reply. As our responses are very positive, it might be argued that our students with positive views towards webcasting were the ones who replied. However, a 60% response compares favourably with another study  which only achieved a 25% response rate. Given that two thirds chose webcasting in preference to face-to-face lectures and that the majority of those who then completed questionnaires were in favour of webcasting, we suggest that this method of teaching and learning is worthy of further trials. This small evaluation study suggests that nursing and midwifery students engage well with webcasting, with synchronous interaction between lecturers and students. Webcasting may offer educational benefits including increased participation and discussion, as well as fostering a more in-depth understanding of concepts compared to traditional lecturing in large groups [14, 17]. Webcasting can also save students’ time and money  and help with potential conflicts that can occur between students’ family and home lives and attendance at university . These are attractive ideas for any HEI, and particularly so for those seeking to enrol and retain healthcare students who tend to be mature women. We recommend that other HEIs investigate the potential that webcasting has for their students, and that further research is undertaken in large-scale experimental designs to investigate variables including the depth of students’ learning, students’ expectations versus their real experience of webcasts, and students’ assessment achievement scores and satisfaction with the webcast experience compared to traditional lecture formats. Further research is also necessary to gain a fuller understanding of how webcasting might combine with other methods such as small-group tutorials, and the costs and benefits associated with webcasting to organisations, students and staff. Internally funded by Faculty of Health and Social Work. Study design: GRW, IM and JM. Data analysis: GRW, IM, RJ and JM. Manuscript preparation: GRW, IM, RJ and JM. Jones R, Skirton H, McMullan M. Feasibility of combining e-health for patients with e-learning for students using synchronous technologies J Adv Nurs 2006; 56(1): 99-109. Ostrow L, DiMaria-Ghalili RA. Distance education for graduate nursing: one state school’s experience J Nurs Educ 2005; 44(1): 5-10. DiMaria-Ghalili RA, Ostrow L, Rodney K. Webcasting: a new instructional technology in distance graduate nursing education J Nurs Edu 2005; 44(1): 11-8. Yunus AS, Kasa Z, Asmuni A, et al. Use of webcasting technology in teaching higher Int Educ J 2006; 7(7): 916-23. Valaitis R, Akhtar-Danesh N, Eva K, Levinson A, Wainman B. Pragmatists, positive communicators, and shy enthusiasts: three viewpoints on Web conferencing in health sciences education J Med Internet Res 2007; 9(5): e39. Yagi I, Ahmed W, Gross M, et al. Webcasting pathology department conferences in a geographically distributed medical center Hum Pathol 2004; 35(7): 790-97. Phillips J, Billings DM. Using webcasts for continuing education in nursing J Contin Educ Nurs 2007; 38(4): 152-3. DiMaria-Ghalili RA, Ostrow L, Rodney K. Webcasting: a new instructional technology in distance graduate nursing education J Nurs Educ 2005; 44(1): 11-8. Scott PJ, Quick K. Heroic failures in disseminating novel e-learning technologies to corporate clients: a case study of interactive webcasting AIM International Conference Proceeding Series. Vol 92 In: Proceedings of the 4th international symposium on Information and communication technologies; Cape Town, South Africa. 2005; pp. : 26-31. Elo S, Kynga SH. The qualitative content analysis process J Adv Nurs 2008; 62(1): 107-5. Kevern J, Webb C. Mature women’s experiences of preregistration nurse education J Adv Nurs 2004; 45(3): 297-306. Dyson BJ. Assessing small-scale interventions in large-scale teaching: A general methodology and preliminary data Active Learn Higher Educ 2008; 9: 265-82. Kember D, Ho A, Hong C. The importance of establishing relevance in motivating student learning Active Learn Higher Educ 2008; 9: 249-63. Cook DA, Levinson AJ, Garside S, Dupras DM, Erwin PJ, Montori VM. Internet-based learning in the health professions: a meta-analysis JAMA 2008; 300(10): 1181-96. Benson A, Blackman D. Can research methods ever be interesting? Active Learn Higher Educ 2003; 4(1): 39-55. Edwards P, Roberts I, Clarke M, et al. Questionnaires: systematic review Increasing response rates to postal BMJ 2002; 324(11): 83.